Is there an easy way to monetize your podcasts? 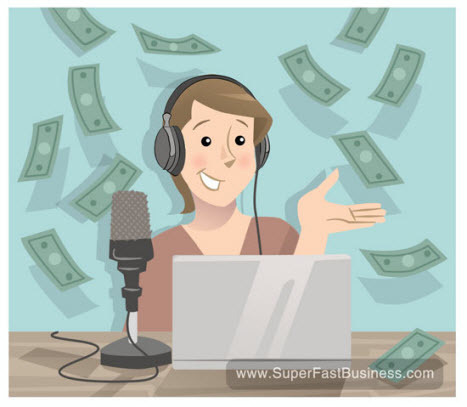 A podcast is a traffic source that can be easily monetized. 00:22 – Why a podcast is not a product! Hi, this is James Schramko and in this business tip, I’m going to tell you how to monetize a podcast. I get this question a lot. People are interested in the idea of a podcast or they already have a podcast and they want to know how to monetize it. The answer is actually very simple. You need a product or service to sell, that’s it. You see, a podcast is a traffic source. It shouldn’t be treated as a product. And I think that’s a big mistake that people make. Once you have your traffic coming from the podcast, all you need to do is mention your product or anyone else’s product for that matter and direct people to your source or to your link. I’ve used podcast to sell a lot of affiliate products. In fact I’m the number one affiliate in the world for product. And my most common method of talking about it is just mentioning it in my podcast and the bonus that I have for it; which I sell from BuyWithBonus.com. So, if you want to make money from a podcast, build your customer list. Keep people coming back. Let them know when the new episode’s out and put out really good quality content, and that will serve as a great traffic source. Then, tell people what problems you solved and where they can go to get it. And if it happens to be a product or service of yours or someone else as an affiliate, you’ll be out to monetize your podcast. And I think that’s much easier than selling, advertising and all of that stuff. So, I hope you find this useful. I’m James Schramko coming to you from Manila today. Are you ready to monetize your podcasts? Feel free to leave your comments below. Completely agree. A podcast is simply a traffic source. Although one could sell affiliate products (Just to get started), I would strongly recommend creating and selling your own products and/or services for maximum profits. I currently have 5 podcasts (I do not host all 5) that I am developing into a network (Tip: Advertisers prefer to make ad buys with a network). In conclusion, a podcast can be monetized in a number of ways including, affiliate sales, selling your own products. Once your podcast matures, you can employ more advanced strategies such as, selling ad space on your podcast website, sponsorships, joint ventures (eg. James Schramko & Lead Player), licensing, subscriptions (Unique content), membership site (Access to Forums), and even more. Great post and looking forward to the next! great advice! hope you’re enjoying the summer weather here lately. it’s a real scorcher! !